If you haven’t heard of yiwu wholesale wall stickers you’re not alone, but they’re fast becoming a popular solution for giving any room that WOW factor. Yiwu wholesale wall sticker ,namely ,is a kind of Paper that can vivify plain wall .There are gorgerous designs and varies sizes of yiwu wholesale wall stickers in the futian market .Yiwu wholesale wall sticker can be devided into vinyl wall sticker and 3-D removable wall sticker . 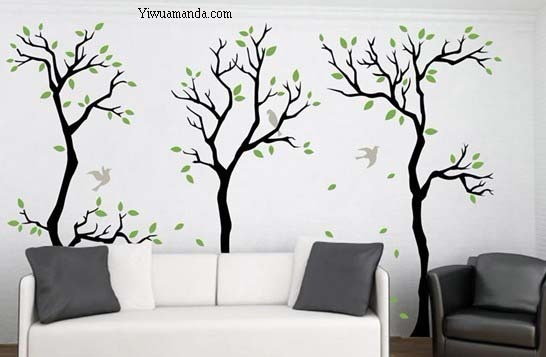 Vinyl wall sticker,is a plane wall sticker .If your room looks plain ,then you can buy vinyl wall sticker to rich your room .This is a trend of decorating room with low cost . 3-D removable wall sticker has a dimensional effect that looks more lifelike. Yiwu wholesale wall sticker is in the 1st floor of H area,District 2 of futian market . More information about yiwu wholesale wall sticker, pls contact us.